For registrations after April 10, please register on-site. You can also make a hotel reservation here. Please bring your Student ID to the registration desk. Booking for the technical tours has closed. the consignment of the agency sales from Kinki Nippon Tourist Co., Ltd. which is the travel agent planning and operating agent-organized tours. For further information please check out the Agent-Organized Tour Terms and Condition. On-site registration fees are the same as regular registration fees. Member pricing is for individual members of AESJ, ANS, KNS, SFEN and JSME only. One registration must be made for each paper (basically by the 1st author), by the Final Papers / Copyright deadline. "Accompanying Person" must be a spouse or a family member of the registered participant. Please click the "On-line Registration" button at the bottom of this page for pre-registration. Please make your payment at the On-site Registration Desk. American Express, Visa, Master Card, Diners Club and JCB are acceptable. Remittance must be completed within 10 days after the "On-line Registration ". 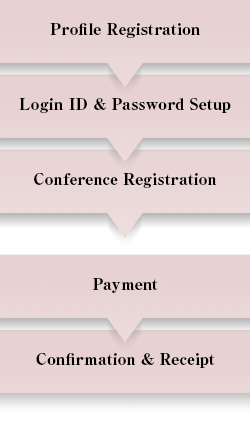 Bank account information will be provided on the last page of the "On-line Registration ". Please note that all transfer charges must be paid by participants. Please make sure to indicate your name and registration number. 1. Please access the online registration system through the button at the bottom of this page and enter your profile. 2. A URL will be sent to your email address to set up your Login ID and password. 3. Please select your registration category and other options. *In the case you have already registered as an author, please start from this step. 4. Please choose a payment method, either via credit card or via bank transfer (bank transfer is only available for early pre-registration). *If a payment method is not chosen within the next one hour, pending registrations will be automatically cancelled. 5. A confirmation letter and receipt can be printed out when the payment is confirmed. To change/add registrations after fixing on the payment method, please click on your registration no. on the menu page of the online system.. Your registration confirmation and receipt can be printed out through the "On-line Registration" page, when you have completed your payment. The receipt can be printed only once. Please inquire the Registration Desk if you have failed to print it out. The registration confirmation can be printed out as many times as you wish by April 28, 2017. Registration cancellations must be notified in writing to the Registration Desk via e-mail. Registration cancellations must be made prior to March 21, 2017, in order to receive a refund minus JPY20,000 processing fees. There are no refunds on meeting registrations, social events and tours for cancellations after March 20, 2017. To make your registration please click the "On-line Registration" button below. You can download the user manual of the ICAPP2017 Registration System here. If you have problems with the on-line registration please contact the ICAPPP2017 Registration Desk first and then make use of this registration form. To visit Japan, you must have a valid passport. A visa is required for citizens of countries that do not have visa-exempt agreements with Japan. If you need a symposium invitation letter to arrange a visa, kindly contact the registration desk: icapp2017registrar@convention.co.jp after your official registration. ICAPP 2017 will be hosted at the Hotel Fujita Fukui and the Westin Miyako Kyoto. Reservations can be made by clicking on the links below. The number of rooms are limited. Reservations for the Hotel Fujita Fukui / Yours Hotel Fukui and The Westin Miyako Kyoto must be booked by March 23, 2017 and March 31, 2017 respectively in order to receive the group rate. Rooms booked after this date may be reserved at the hotels prevailing rate, based on availability.